The International Certificate of Competence (ICC) is a certificate endorsed by the United Nations Economic Commission for Europe (UNECE). It provides proof of competence. The certificate can be for either power or sail. Corfu Sea School is an ICC test centre and can provide its clients with an exam which is part theory and part practical (this normally takes normally 3-4 hours). Although only guaranteed to be accepted in countries that have adopted the relevant UN Resolution, the ICC is a useful document to carry and will generally be accepted where proof of competence is required. This is just a ‘test’, no tuition is provided. 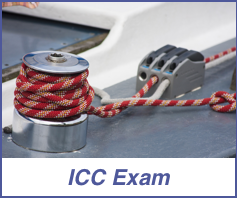 Candidates must demonstrate: Man overboard recovery, mooring and sailing ability, knowledge of Rules of the road, navigation and basic tides. If you need to brush up on your rules of the road or navigation we offer an online course that covers everything you need to know. We suggest checking the above page regularly as acceptance by certain countries can change. Price includes exam, fuel, mooring fees, use of wet weather clothing and Greek VAT at the appropriate rate.